1Mexican Society of Public Health, A.C.Tabasco, Mexico. 2Division Academy of Health Sciences, Juarez Autonomic University of Tabasco. Tabasco, Mexico. Depression (Key CIE-10 F32) is defined as light, moderate or severe episodes of mood declining, with energy reduction and decrease of capacity to feel joy, of interest and concentration, plus frequent tiredness even if minimum strength is used. Normally, sleep is perturbed, hanger diminishes, self-esteem and self-confidence decline and frequently there are ideas of guilt or uselessness, even in light forms of the disease [1,2]. The most common depressive problems are: Major Depression, Dysthymia and Bipolar Disorder  Depression is the psychiatric disease most frequently seen by the general health practitioner [4,5]. However, close to 50% of the doctors does not show a good willingness for attention of people suffering from it, and for this reason depression is sub-diagnosed [6-9]. In Spain, depression affects approximately 9,6% of adults. In United Sates of America, it is estimated that every year 10% of adult population suffer from it; the most affected population is of 18-44 years, and of this group women present the double of episodes compared to men . In Mexico, depression has its maximum incidence in women of 35- 45 years. Prevalence in general population is 6-12% at lifetime 6% in men and 10% in women. In high-risk populations, like older adults prevalence is more high, affecting the 37,2% of population . In Republic of Mexican States, the higher rates of suicide X 100.000 habitants, were registered in: Querétaro 23,5, Oaxaca 12,7, Aguascalientes 12,1, Sonora 11,8, Morelos 11,1, Campeche 9,0, Durango 8,8, Tabasco 8,7, Colima 8,6, and San Luís Potosí 8,5. The fact that depression appears more frequently in “mature” women is a broadly studied field. The most accepted hypothesis postulates that it is because of the estrogenic diminishment, associated with perimenopause, which affects in the axis of hypothalamus-hypophysis, modifying some behaviour fields . Various authors have investigated the prevalence of Depression in women with perimenopause. They have found rates of presentation from 14,9% to 30%, presented normally in a mean age of 49,5 years, varying the frequency of presentation in function with the premenstrual period, regular menstrual cycles, postmenopausal, and disorders related to endothelial dysfunction[15-18]. These findings were obtained in United States of America populations. Studies in Spanish speaking countries are rare; there was only found one study of Spain and one of Mexico. The Spanish study reports that 42% of women with perimenopause present Depression . While The Mexican study reported a prevalence of 57,2% of depression, in women of 40-59 years . This absence of Spanish studies makes clear the little knowledge about the subject. In Mexico, the Social Evolution Secretary (SEDESOL) implemented the “Opportunity Programme” in 1997, destined to rural and urban families in situation of poorness (alimentary, of capacities or patrimonial), that suffer from more school desertion, more diseases and malnutrition and less possibilities of finding more productive and better remunerated employments. Its purpose is to reach equality of opportunities. It is constituted by the following means of support to the beneficiaries: monetary resources every two months, scholarships up to the last grade of middle superior education, economic support for young people that finish middle superior education before completing 22 years, monetary support for obtain scholar staff at the beginning of every school year, Basic health pack guaranteed and community workshops for achieving skills of self care, alimentary complements for children suffering from malnutrition and pregnant women or in breast feeding period, economical support for older adults of 70 years, support for compensating expenses of energy consuming and support of alimentary expenses every two months. Nowadays there are 5 millions of beneficiary families . In order to give to the beneficiary families the previous described supports, it is necessary that their integrants assist to Community Health Centres (CSC) once a month, so as to receive the medical preventive attention and self care abilities. The absence of one of the integrants to any of these activities, constitutes a family absence and deprive them temporarily of the programme benefits, and a second occurrence causes a definitive expulsion of the programme. During the implementation of “Opportunities Programme” in the Community Health Center of “Río Seco y Montaña 1st Section”, located in Huimanguillo, Tabasco, Mexico, where most families of this and other close communities are members, it was observed that women use to go to the medical and preventive appointment alone causing them affliction. Moreover, it was estimated that in women suffering from Diabetes Mellitus and Arterial Hypertension, it is not possible to maintain their situation under control, even though they report to complete pharmacological and non-pharmacological treatment. In addition, it was observed that in this group there were frequent appointments for converted crises, triggered by family confusions. This context brought the attention to this group, observing that this phenomenon was presented with more frequency in women of 40-59 years. So, this statement raised the question: which characteristic does this group have that commonly causes the facts exposed above? The answer to this question that explained the phenomenon in a reasonable way was one: “Depression”. Consequently, this study was designed in order to determine the prevalence of Depression and its associated factors in women with perimenopause, residents of Ranchería Río Seco y Montaña 1st Section, of Huimanguillo, Tabasco, México. A concurrent study was carried out, in which participated a universal simple of 40 women aged between 40 and 59 years, residents in Ranchería Río Seco y Montaña 1st Section, Huimanguillo, Tabasco, México. The simple didn´t suffer from cognitive dysfunctions or physical disorders. Have accepted to participate and have authorised their participation through informed consense. The following variables were included: age, civil status, occupation, school years, finance income per month, number of sons, pregnancies, labours, caesarean births, abortions, litter deaths and dead sons, hysterectomies, climacterium, premenopause (woman of 40-years that has the period but in irregular periods), postmenopausal (woman of 40-59 years, that does not have the period for a year or more, for a natural cause or as a consequence of an hysterectomy/ salpyngotomy or/and ovariotomy) –in the interval between pre and post menopause in the range of age cited, it is denominated perimenopause (before and after the last menstruation) –and hormonal therapy of replacement. In order to collect the necessary information, we chose two validated and self-administered instruments, the “Apgar Familiar” and the “Zung Self Administered Depression Scale”, for determining the perception of family functioning and Depression respectively. The cut-off point for the first instrument was a 6 or less score (so as to consider the family functioning dysfunctional), and for the second a score higher than 50 was considered as a depression index. The “Apgar Familiar” assesses the systemic family functioning, according to the individual’s perception of whether family could be considered a resource, or on the contrary has a negative influence upon him/ her. Consists on five components of family function: adaptability, cooperation, evolution, affective state and resolution capacity. Instrument validation has reported an up to 80% (_=0,8) reliability [22-26]. The “Zung Self Administered Depression Scale”, is a scale that quantifies symptoms in an empirical base, derived in a way from de Hamilton Depression Scale. It is a self-administered scale that consists in 20 phrases related to depression, half formulated by positive terms and half by negative terms. Somatic and cognitive symptoms have a great weight, represented by 8 items for each group, and this scale complement two items referring to mood state and two items referring to psychomotor symptoms. Patient quantifies frequency of every symptom and not its intensity. The scale has good index of reliability (0,70-0,80 of half split reliability, and Cronbach index between 0,79 and 0,92) [27,28]. Correlation indexes with other scales (Hamilton Depression Scale and Beck Depression Inventory) and with global clinical judgement oscillate between 0,50 and 0,80 [29-30]. This scale is not considered an adequate scale for detection of depression in geriatric populations. For this kind of cases Yessavage Scale offers better psychometric indexes [31-33]. Even though this scale was not designed for screening, shows acceptable indexes of sensibility (85%) and specificity (75%), when it is administered for case detection in clinical or general populations  and has been widely used for this purpose. Additionally, 15 questions were formulated, in order to obtain sociodemographic and gynecobstetric data, define the profile of the studied group and achieve the data for identifying factors associated to Depression. Data were collected by investigators that coordinated reunions with participants of the study in the Communal House of the community and proceeded to domestic visits during the period from October 2007 to April 2008.. El this study was approved by the related Investigation Committee. Collected information was analysed by dispersion measures, preference and central tendency and odds ratio (OR) with 95% of confidence (p≤0,05), estimated by the Epi-Info software‚ version 3.3.2 (freeware distributed by the Center of Disease Control and Prevention [CDC] of U.S.A.). For the odds ratio estimation, subjects with Depression were considered the “case” group. 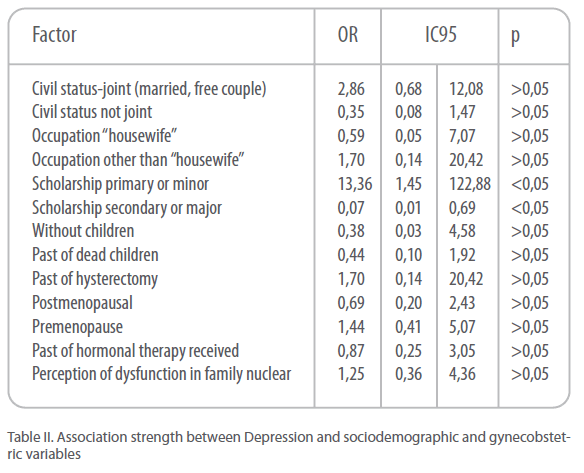 The “exposed” group was defined by the presence or absence of sociodemographic and gynecobstetric variables, considered as risk factors for Depression, at this and other age groups, by the authors [14-20,35-37], with the aim of verify or reject the presence of associations between them in the target population of this study. Mean age of the sample was 47,7±5,6 years, with lowest age 40 years, and highest age 59 years, medium age 47 years and mode age 42 years. 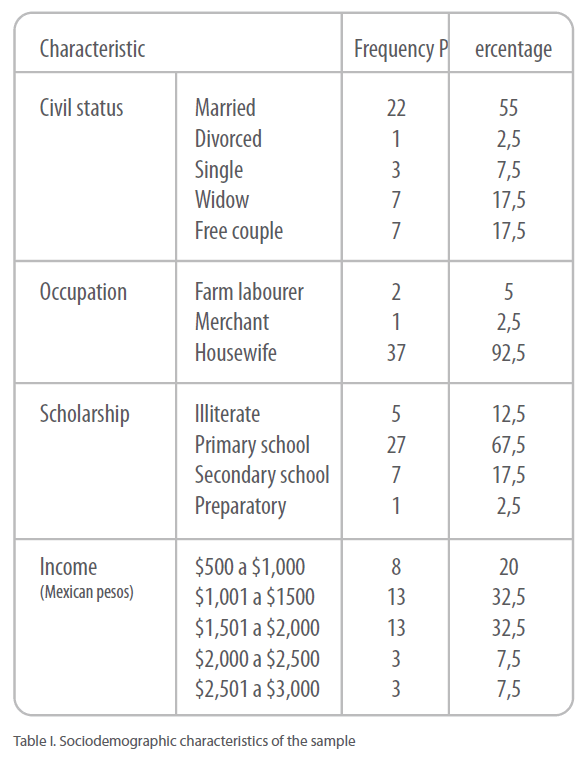 As far as sociodemographic profile is concerned, predominated married women (55%), housewives (92,5%), with 6 or less years of school (80%), mean income per month up to $2.000,00 (Mexican pesos). The rest of sociodemographic characteristics of the simple are exposed to Table I. Referring to the gynecobstetric profile, mean of pregnancies was 4,7±2,9, with a minimum of 0 and a maximum of 10, which were resolved by vaginal via, except from one abortion and two obits. 25% of them declared that had lived a death of a son (without specifying the age of death or time passed since then). Gynecobstetric antecedents of major relevance: hysterectomy, menopause and hormonal therapy of replacement, were presented at 7,5%, 45% and 42,5%, respectively. 52,5% of them perceived functionality at their family nuclear, 30% of them perceived moderate dysfunction and 17,5% of them perceived severe dysfunction. In sum, prevalence of family dysfunction was of 47,5%. Prevalence of Depression was 55%, equivalent to 22 cases, of which 42,8% were light, 33,3% were moderate and 23,9% were severe. This rate is bigger than the indicated by other foreign authors like Bromberger et al., that informed a prevalence of 14,9-18,4% of depressive symptoms in this age group (in U.S.A) ; Richards et al., that indicated a 26% (in U.S.A); and Barreiro et al., that informed of a 42% (in Spain) . Such a difference, could be attributed to sociodemographic divergences that exist in populations of U.S.A and Spain (Developed countries) compared to Mexico (developing country), and to instruments used in those studies in order to obtain Depression diagnosis, that are different from the instrument applied in this study. Also, prevalence obtained in this study is lower than the one found in a Mexican study of Peralta-Predero y cols., who informed of a prevalence of 57,2%, difference that could be attributed on the one hand to demographic differences between populations, as that study extracted the sample from an urban population with a middle socioeconomic level, and the present study was realised with a rural population with low socioeconomic level. On the other hand, perhaps it could be attributed to the divergence of the instruments applied, as those authors administrated the “ Epidemiologic Studies Depression Questionnaire”. Besides that, mean of age that Depression was presented was of 46,2±4,1 years, similar to the one found by Harlow et al., one of 49,5 years, and also similar to the one reported by Peralta-Predero et al., one of 48,2 years,. This similarity is probably due to the biological aspect of the disease, that does not really fluctuate depending on the geographic region studied. Searching for an association between Depression and sociodemographic and gynecobstetric variables, there was only found an association with years of scholarship “primary or minor”- risk factor- OR 13,36 (IC95 1,45-122,88), “secondary or major” – protective factor – OR 0,07 (IC95 0,01-0,69); the rest of variables did not present an significant statistic association (Table II). This absence of evidence for affirming or rejecting the role of posmenopause as a risk factor for Depression, results are contrary to those reported by Wagner et al., who found a significant statistic between these phenomenon; difference that could be attributed to a systematization error of the author, who studied only women in menopause, excluding this way those in premenopause and climacterium. This makes it impossible to know whether el phenomenon, Depression in this case, appears with the same, lower or higher intensity, compared to the posmenopause group. What’s more, this author informed of a significant statistic association in this same group, between endotelial disorders and Depression. This association was not explored in this study. On the contrary, Lara-Tapia et al., reported of a significant statistic association between climacterium (premenopause) and Depression, that was incremented with the administration of hormonal treatment. Both associations were not found in this study, as there was no evidence for affirming or rejecting these associations. Moreover, in the present study there were no inquiries made about the influence of menstrual circles on the prevalence of Depression, suggested by Freeman et al. , so it is not possible to affirm or reject the existence of this kind of association. As far as the sociodemographic factors investigated is concerned, in this study there was no association found with family dysfunction, fact that concurs with that of Peralta-Pedrero et al., in this same group of age. Nevertheless, these authors found a significant association between Depression and family dysfunction in women aged between 20-39 years old. This could be attributed to the fact that young people (during the first years of adult life) present a major sensibleness to changes and personal losses (examples: family dysfunctions, family break-ups, girlfriend/boyfriend break-ups, changes of house or school, pregnancy etc.) compared to people in a more mature age. Lastly, the association between Years of scholarship/ Depression found in this study, is a finding in this group of age that although described by authors like Chevalier & Feinstein, y Zavala-González & Domínguez-Sosa, that report that risk of Depression increments up to a 20% in subjects with low scholarship (in general population and older adults respectively), there are no references about similar findings in women of 40-59 years old (group with specific characteristics investigated in this study). Depression prevalence in women with perimenopause in this study is elevated. A high prevalence of family dysfunction is also found, without having any association with suffering depression. Scholarship is a determinant factor for Depression presence in women of 40-59 years old, whose frequency of presentation is indirectly proportional to years of scholarship. More extensive studies are required, including bigger samples, stricter inclusion criteria and taking into account other variables, in order to lead to better conclusions. Findings of this study corroborate that Depression and Family Dysfunction are subdiagnosticated disorders that play an important role in the process health-illness in the community. For this reason, it is recommended to establish technical-medical lines, to do screening in the general population, with emphasis on the vulnerable groups, which permit to make a praecox diagnosis and offer the accurate treatment. furthermore, taking Under consideration the absence of Iberoamerican studies about women with perimenopause, that constitute a risk group, which number is getting bigger because of demographic transition, it is recommended to reproduce this study in other regions of Spanish speaking populations, with emphasis on Mexico and Latin America, so as to ameliorate local and regional knowledge of the phenomenon. Acknowledgements. Authors give special thanks to the personnel of Community Health Center of “Río Seco y Montaña 1st Section” of the Secretary of Health of Tabasco State (Mexico), facilities supplied for the population localization and the support to the calling of the subjects of this study. Elkin GD. Psiquiatría Clínica. México D.F. : McGraw Hill, 2000:64-85. Halabe J, Lifshitz A, López-Barcena J y cols. El internista. México D.F. : McGraw Hill, 1997:780-5. American Psychiatry Association. Diagnostic and Statistical Manual of Mental Disorders. 4ª Edición. Buenos Aires: Masson, 1996. Callahan CM, Hendrie HC, Dittus R, Brater DC, et al. Improving treatment of late depression in primary care. J Am Geriatry Soc. 1994;42:839-46. Casal E, Vázquez E, Payanas R y Oréese C. Motivos de consulta en medicina Interna general. Rev Hosp Clin “José de San Martín”. 1992;6:35-40. Silver FW, Ruckle JL. Depression: management techniques in primary care. Post Med. 1989;85:359-66. Muñoz RF, Hollon SD, McGrath E et al. The AHCPR depression in primary care guidelines. Am Psychologist. 1994;49:42-61. Lista-Várela A, Boussard M, Labarthe A. La depresión en el escenario del médico general e internista. México D.F. : Pfizer Corp., 2000:1-78. De-Santillana HP, Alvarado ME. Depresión en población adulta mayor. Tamizaje en una unidad de primer nivel de atención médica. Rev Med Ins Mex Seguro Soc. 1999;37(2):111-5. Serrano-Blanco A, Palao DJ, Luciano JV, et al. Prevalence of mental disorders in primary care: results from the diagnosis and treatment of mental disorders in primary care study (DASMAP). Soc Psychiatry Psychiatr Epidemiol. 2009. Solomon DA, Leon AC, Maser JD, et al. Distinguishing bipolar major depression from unipolar major depression with the screening assessment of depression- polarity (SAD-P). J Clin Psychiatry. 2006;67(3):434-42. Bautista-Sánchez A, Rodríguez-García R, Rodríguez-Guzmán LM. Epidemiología de la depresión en México. Boletín de Epidemiología. 2004;21(39):17. Instituto Nacional de Estadística, Geografía e Informática. Estadísticas de suicidios consumados. Cuaderno No. 7. México D.F. : INEGI, 2004. Harlow BL, Wise LA, Otto MW, Soares CN, Cohen LS. Depression and its influence on reproductive endocrine and menstrual cycle markers associated whith perimenopause. Arch Gen Psychiatry. 2005;60:29-36. Bromberger JT, Assman SF, Avis NE, Schoken M, Kravitz HM, Cordal A. Persistent mood symptoms in a multiethnic community cohort of pre- and perimenopausal women. Am J Epidemiol. 2005;158:347-56. Richards M, Rubinoww DR, Daly RC, Schmidt PJ. Premenstrual symptoms and perimenopausal depression. Am J Psychiatry. 2006;163:133-7. Wagner JA, Tennen H, Mansoor GA, Abbott G. History of major depressive disorder and endothelial function in postmenopausal women. Psychosomatic Medicine. 2006;68:80-6. Freeman EW, Sammel MD, Liu L, Gracia CR, Nelson DB, Hollander L. Hormones and menopausal status as predictors of depression in women in transition to menopause. Arch Gen Psychiatry. 2005;61:62-70. Barreiro AC, Safont TA, Sánchez A, Durbán FJ, Manget S. Estudio de morbilidad psíquica en la perimenopausia. Concordancia diagnóstica entre un equipo de atención primaria y su centro de salud mental de referencia. Aten Primaria. 1998;21(9):613-6. Peralta-Pedrero ML, Mercado-Castelazo E, Cruz-Avelar A, Sánchez-Márquez O, Lemus-Rocha R, Martínez-García MC. Prevalencia de depresión y factores de riesgo en mujeres atendidas en medicina familiar. Rev Med Ins Mex Seguro Soc. 2006;44(5):409-14. Smilkestein G. The family Apgar: a proposal of a family function test and its use by physicians. J Fam Pract. 1978;6:1231-9. Smilkestein G, Ashworth C, Montano D. Validity and reliability of the family Apgar as a test of family function. J Fam Pract. 1982;15:303-11. Arias L, Herrera A. El Apgar familiar en el cuidado primario de salud. Colombia Médica. 1994;25:26-8. Bellón AS, Delgado S. Validez y fiabiliad del cuestionario de función familiar Apgar Familiar. Aten Primaria. 1996;18(6):289-96. Gómez FJ, Irigoyen AE, Ponce ER. Selección y análisis de instrumentos para la evaluación de la estructura y funcionalidad familiar. Arch Med Fam. 1999;1(2):45- 57. Vázquez C, Jiménez F. Depresión y manía. En: Bulbena A, Berrios G, Fernández dez de Larrinoa P (eds). Medición clínica en psiquiatría y psicología. Barcelona: Masson S.A., 2000:271-2. Conde V, Esteban T. Fiabilidad de la SDS (Self-Rating Depresión Scale) de Zung. Rev Psicol Gen Aplic. 1975;30:903-13. Hamilton M, Shapiro CM, Depression. En: Peck DF, Shapiro CM (eds). Measuring human problems. New York: Wiley, 1990:27,37. Steiz R. Five psychological measures of neurotic depression. A correlation study. J Clin Psychol. 1970;26:504-5. Burns A, Lawlor B, Craig S. Assessment scales in old age psychiatry. London: Martin Dunitz Ltd., 1999:252. 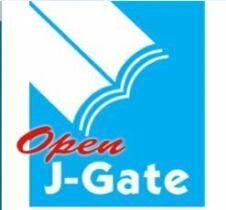 Okimoto JT, Barnes RF, Veith RC, et al. Screening for depression in geriatric medical patients. Am J Psychiatry. 1982;139:799-802. Van Marwijk H, Hoeksema HL, Hermans JO, et al. Prevalence of depressive symptoms and depressive disorder in Primary Care patients over 65 years of age. Family Practice. 1994;11:80-4. Mulrow CD, Williams JW, Gerety MB, et al. Case-finding instruments for depression in primary care settings. Ann Intern Med. 1995;122:913-21. Lara-Tapia H, Bravo LM, Meléndez-Montiel JD, Gutiérrez-Campos E. Depresión mayor y menopausia. Un estudio controlado. Revista Neurología, Neurocirugía y Psiquiatría. 2002;35(3):138-43. Zavala-González MA, Domínguez-Sosa G. Depresión y percepción de la funcionalidad familiar en adultos mayores de zonas urbanas de Cárdenas, Tabasco [resumen]. Aten Fam. 2009;16(Suppl1):4.